Yummm, I'm really diggin' the turquoise and black and silver! I embellished with several goodies from the Curtsey Boutique Etsy Shop. I arranged the banners with foam dots and then added the glittered butterflies. 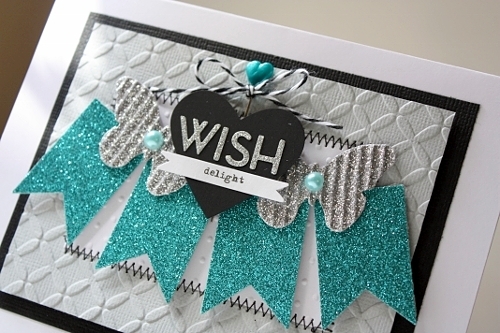 That teal is gorgeous...love the touch the black and white and silver add with the pop of teal! This card is the bomb, girl! Love it a lot! BEAUTIFUL card! 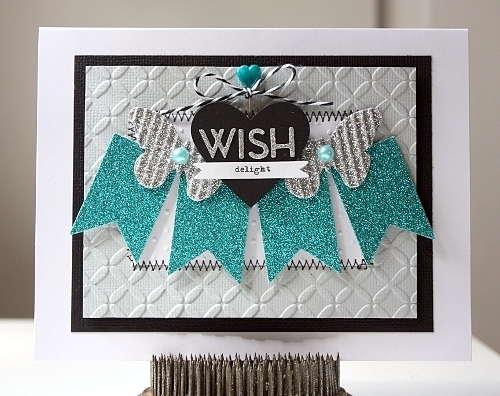 I love the fun turquoise, black and silver together as well:) The design is awesome and love the sparkly papers you used!